If there ever was a reason to get your pets a supply of flea and tick prevention, this is it. A few days ago, the Longhorned tick was found in Maryland- with the Terrapin State being the 8th in the US to report the parasite. It was first reported in New Jersey in 2017, and it has been positively identified in Pennsylvania, Arkansas, New York, Virginia, West Virginia and North Carolina. When it was first identified in New Jersey, it was found on a sheep. When the sheep’s caretaker was shearing the sheep, she became covered in hundreds, if not thousands of ticks. I couldn’t imagine one tick on me, let alone hundreds. What’s unique about these ticks is that they can reproduce asexually, meaning they need no mate in order to lay eggs. In a process called parthenogenesis, the female tick can lay up to 2000 eggs, which are clones of the female. This alone is enough to establish a population in an area. This species of tick doesn’t discriminate between hosts. Some other ticks like the rabbit and moose tick only feed on specific hosts. This tick will feed on anything. The Longhorned tick has a voracious appetite, and a colony of ticks can exsanguinate an animal in less than a day. They will also use birds as hosts. If they prey on migratory birds, there is potential for these ticks to move south in the winter, hitching a ride on their feathered friends. It is scary. 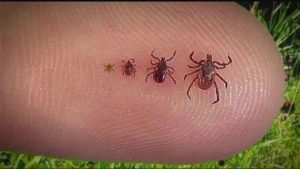 As of now, these ticks have not been found to be spreading any of the normal tick-borne diseases we would be worried about here in the US such as ehrlichiosis, anaplasmosis, Rocky Mountain spotted fever and Lyme disease. However, it is not known yet if they may be able to adapt to transmit such diseases. In Asia, they do spread an illness to humans called SFTS (I’ll spare you the scientific name) and it has a mortality rate of about 5% there in humans. The spread of this tick poses a pretty big threat to livestock, since not all livestock are checked or handled every day like your pets. Long term, scientists will be doing much more research on these parasites, and learn how to best deal with them, as eradication is unlikely. The Longhorned tick is not to be confused with the Lone Star tick. They both have “Texas Sounding” names, but they’re not the same. The Longhorned tick has horn-like protrusions near their head, which require a microscope to see. We’ll keep you updated as necessary. For more information about flea and tick prevention, see my earlier blog here.